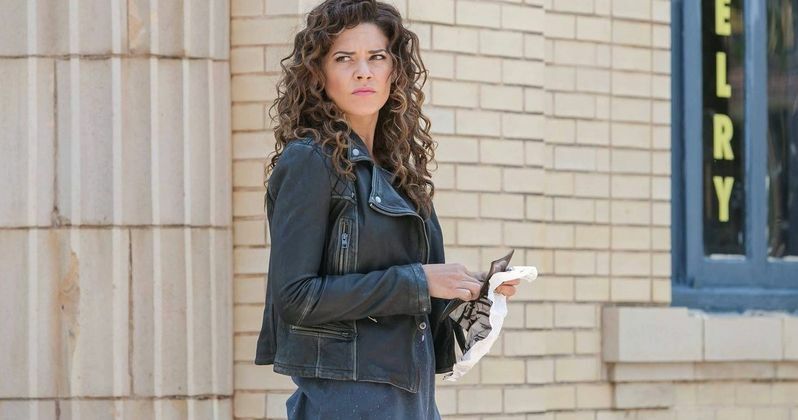 With just two weeks left until the highly-anticipated NBC series Constantine debuts, we have our first look at Angélica Celaya's character Zed with a new trailer and photos. Zed, a longtime fan favorite character from the DC Comics title Hellblazer, wasn't originally a part of the pilot. The show cast Lucy Griffiths as Liv for the pilot episode, but the show's creators decided to scrap the character in July, replacing her with Angélica Celaya's Zed just a few days later. In the comics, Zed is the former lover of John Constantine (Matt Ryan) who has a very dark past. The character will be introduced at the end of Constantine's pilot episode, with her first full episode to come the following week on Friday, October 31. Here's what executive producer Daniel Cerone had to say about Zed in an interview with E! Online. "She's someone who can go toe-to-toe with John, and that's ultimately something we felt like we needed. We wanted a more dynamic relationship, as opposed to someone who is a teacher/mentor and a student. It just didn't feel as fertile and rich of an area as just a strong a man and a strong woman who are both very different." Executive producer David S. Goyer also shed new light about why the decision was made to replace Liv with Zed. "Originally in the pilot we had a character Liv [Lucy Griffiths] that wasn't in the comics. Liv is a great character. She's very wide-eyed, she's very reactive, she doesn't have powers, and when we started to look at the story, we thought this is a character who is always going to be reactive." Take a look at the new Constantine trailer below, along with the new images of Angélica Celaya's Zed.